Besides the benefit of multiplied service capacity, we also deploy emqtt in a cluster to achieve high availability (HA). Even when the traffic load is very low, an emqtt cluster is still advisable, for it is fault-tolerant. The service continues when a single node is failed. The general cluster scenario is a emqtt cluster deployed behind a load balancer. 3) off-load the transport-layer handlings, like TLS/SSL. A load balancer could be software, like HAProxy, or hardware, like F5 device, or virtual resource, like Elastic Load Balancer(ELB), which is available on Amazon’s AWS. The last one could be a common choice if the emqtt is deployed on AWS. In this article, we will show you how to deploy an ELB on AWS for emqtt cluster. In this deployment, the SSL is also enabled. 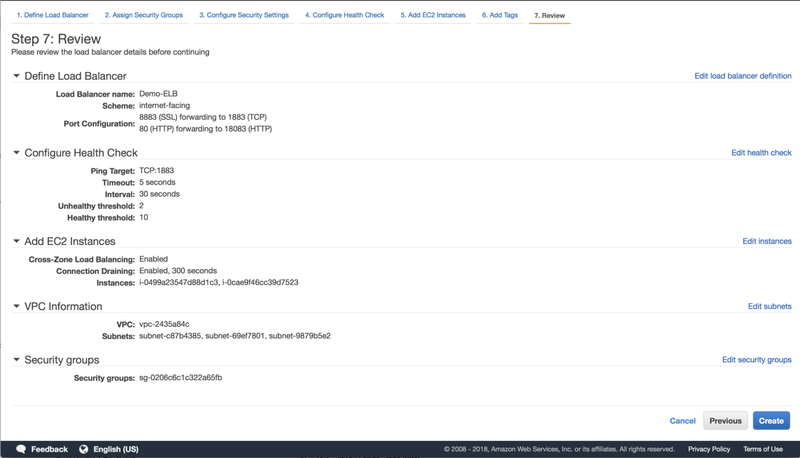 Setup security groups on AWS. A good idea is to put the emqtt cluster nodes in a group which can be accessed in VPC internal and put the ELB in a security group which can be accessed by the out-side world. 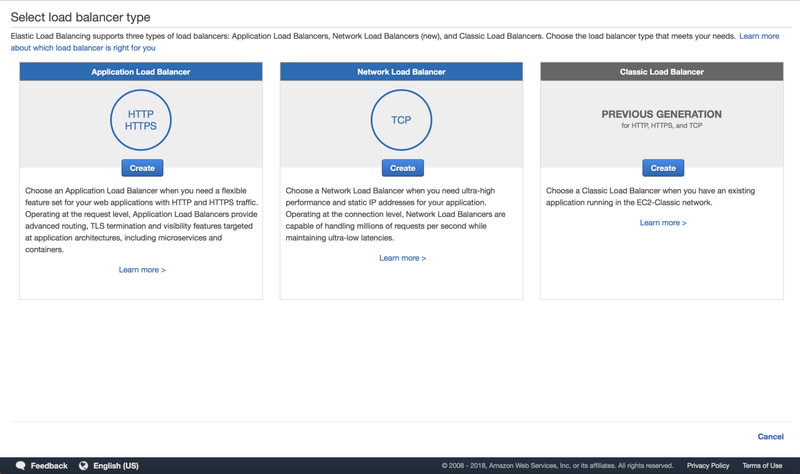 There are three different load balancer available on the AWS’s EC2 Management Console: the application LB, the network LB and the classic LB. Our target is to balance the network traffic and off-load the SSL, the classic LB is the one we need here. The classic LB is marked as previous generation, don’t be frightened. If SSL is not necessary, we can also use a network LB in this place. There are 7 steps to complete the ELB setup, by clicking ‘Create’ button on the Classic Load Balancer block, we start the ELB setup. Step 1: Define Load Balancer. Here we define the LB in a simply way, we assume that the MQTT SSL and emqtt dashboard are the only service on the network. Here it will let you choose creating a new security group or select an existing security group. We have created one group for public access already and we will use it for the ELB. Here the cryptology security will be configured. It decides how the SSL should be used. 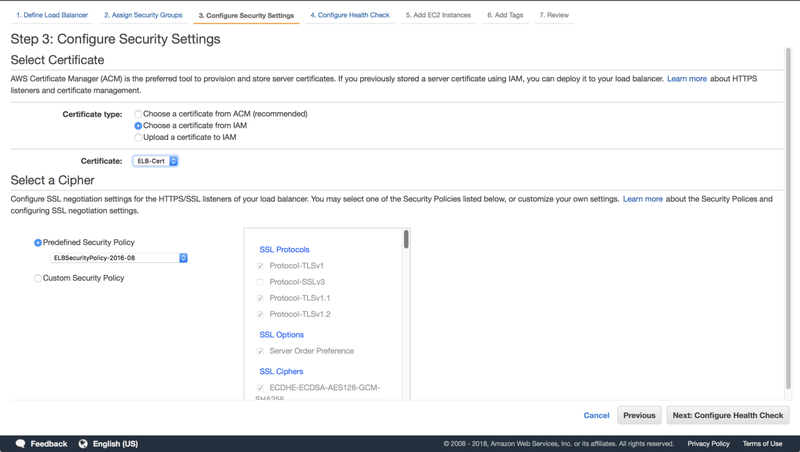 AWS Certificate Manager(AWS) is a tool to provision and store certificates. If you decide let AWS generate and manage certificates for you, ACM will be a good choice. Or, you get the certificate from a third part or you sign your own certificate, you can upload the certificate and its private key to AWS Identity and Access Management (IAM). The certificate and the key must be in pem format. If you have stored certificates in IAM already, you can also use the existing ones. You can select to use the predefined security policy or to customize it. By choosing custom security policy, you can enable/disable the protocol version support, the SSL options and the SSL ciphers. Usually the predefined policy is secure enough, but if you know exactly what protocol version and cipher will be used by the clients, you narrow it down. If you are pretty sure that the private key and the certificate you uploaded in this step is correct, and you you still get an certificate failure later in step 7, don’t panic! It is a known issue, we believe it will be fixed someday. While it is being fixed, you can use the AWS command line tool to upload the certificate and key. We have put a small instruction for it at the end of this article. If an instance failed the health check, it will be removed from the load balancer. The health check can be done by probing on a port with a specified protocol (its not an ICMP ping). In this step the MQTT broker will be added. In our case, they are two instances installed with EMQ in the same VPC. The two instances build an EMQ cluster and configured with proper security group. If necessary, add some key-value pairs as tags. Here we check the setup for the last time, if everything is ok, we create the ELB. We will use mosquitto client to test our setup. If you are not able to upload the server certificate and its private key in step 3, you can try the aws cli tool. The aws cli tool requires python 2.5.6+ or 3.3+, make sure you have the proper python version and pip on your system.